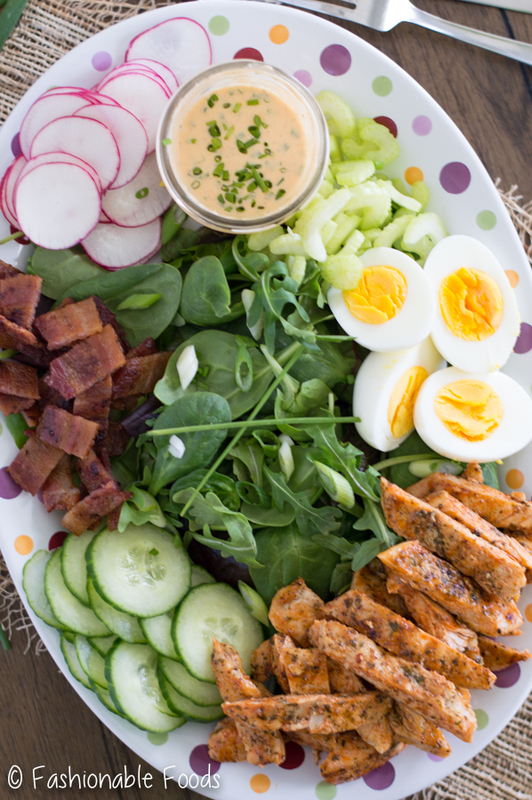 Buffalo chicken and cobb salads are two of my favorite dishes, so the combination of the two is out of this world! 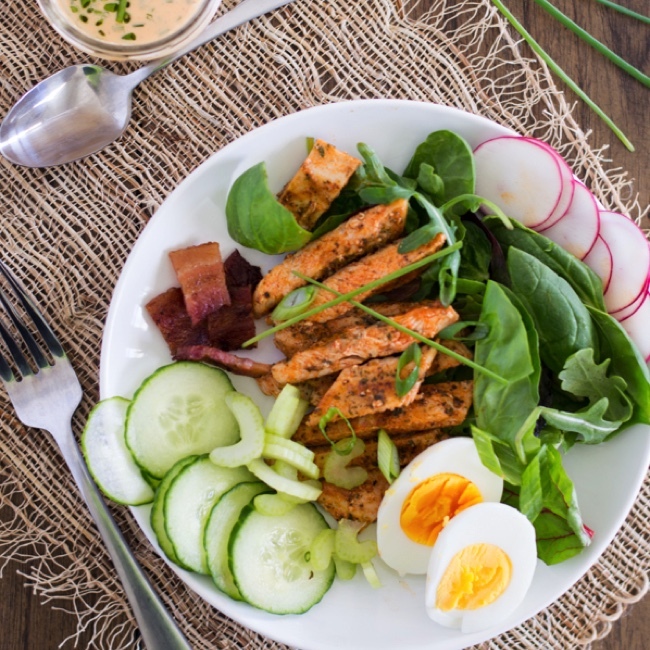 Buffalo chicken cobb salad is full of flavorful chicken, fresh ingredients, and topped off with a buffalo ranch dressing. It’s Fridayyyyyy! A cold one, but still a happy Friday nonetheless. Plans for this weekend? It’s DIY weekend in this house as we start our landscaping project. I’m pretty excited for it to be done, but I’m not really looking forward to all the work it’s going to take to get there! Once I get to the planting flowers step, I’ll be good. I could garden all day long and never tire of it, but all the other steps? I could do without those. I’m most excited for the blueberry bushes that I intend on planting. Last year while buying plants at the greenhouse, I made small talk with one of the employees. Somehow landscaping came up and she suggested blueberry bushes because they look beautiful budding in late spring, then you get blueberries, and then the foliage is great in the fall. Sold! Obviously it will be a few years until I get to reap the benefits of those blueberry bushes, but it will be well worth the wait, I’m sure. Alrighty, let’s get onto the food. New favorite salad alert! Seriously, this is SO SO SO good. 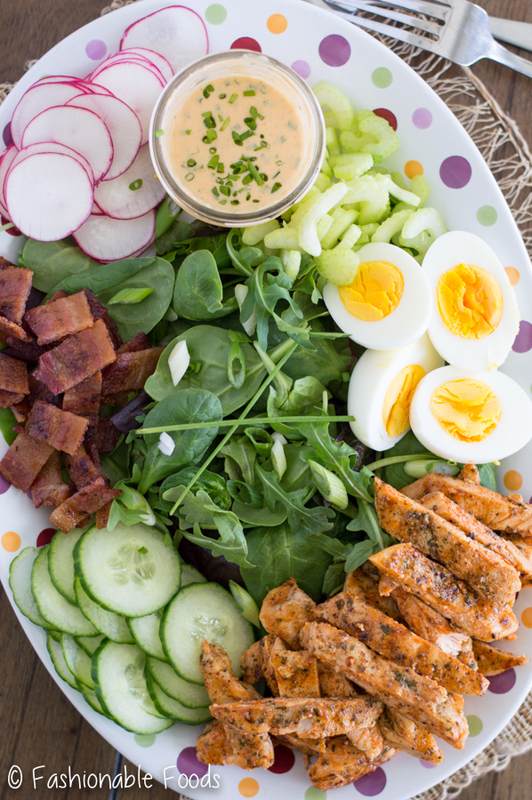 If you love buffalo chicken and cobb salads, you’re going to be as obsessed with this as I am. Not only do we have chicken doused in hot sauce, but we also had buffalo ranch. Yep, you heard me right! 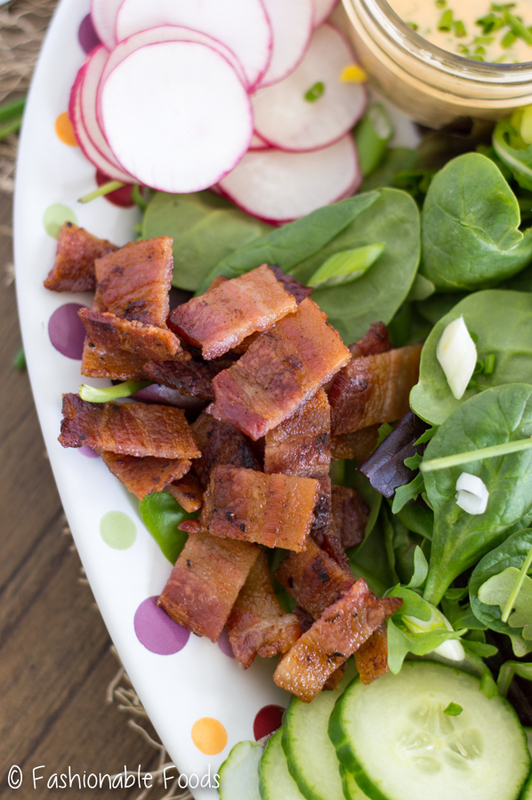 This simple salad is so full of flavor and very versatile when it comes to toppings. First, let’s talk about the chicken. I like to mix up a simple spice rub (salt, pepper, garlic powder, onion powder, parsley) and liberally coat chicken cutlets with it. If you’ve been following me for a while, you know I pretty much never cook a chicken breast as is. I always cut it down into smaller pieces and pound them into cutlets. They cook quickly and are more tender, in my opinion. I just don’t like a thick (and usually always dry) chicken breast. Cutlets stay juicy since they cook fast and evenly. You can use whatever floats your boat here, though. Rotisserie chicken tossed with hot sauce would be just fine… boneless, skinless chicken thighs will work, too. You’ll also need some bacon. 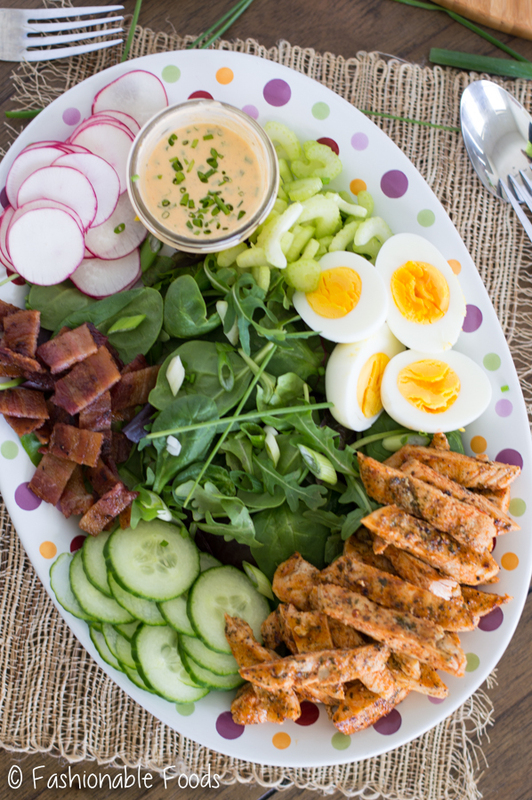 Can’t have a cobb salad without bacon, right? For the last cooked component of the salad we have hard boiled eggs. Can’t have a cobb salad without these either. Well, at least I can’t. You can do whatever you want. ? My favorite way to hard boil eggs is to bring a pot of water to a boil. Carefully lower the eggs into the boiling water and let them boil for 2 minutes. Once the timer goes off, shut the heat off and cover the pot with a lid for 12 minutes. Then, transfer the eggs to a bowl of ice water to cool them for 2 minutes. Peel them all right away and the shells should remove fairly easily. 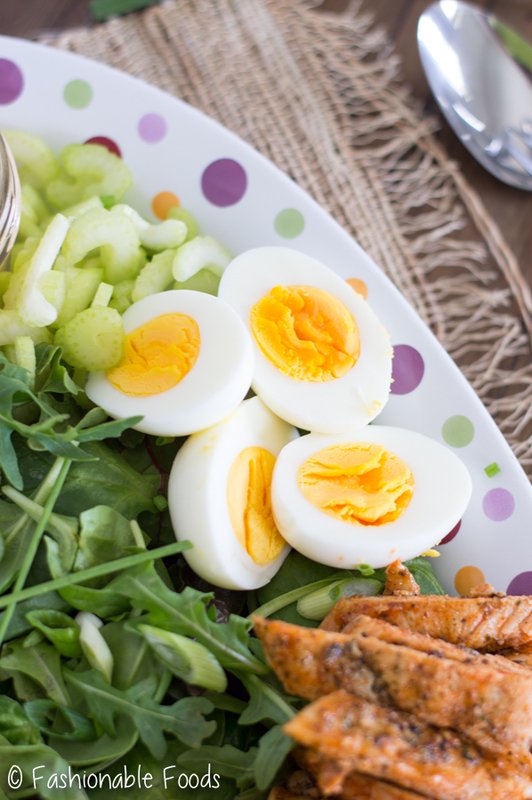 Perfect hard-boiled eggs every single time! Once you have all your cooked components ready, you can begin assembly. That’s the fun part! Start with your favorite lettuce as a base. I went with spring mix and tossed in some spinach and arugula. 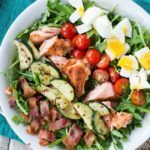 Classic cobb salads use romaine, but I’m so over romaine.. I just prefer more flavorful lettuces. But again, you do you. Use what you like! As for veggies I went with sliced cucumbers, radishes, and celery… can’t have anything buffalo without celery, right? If you want some cheese you can add that too. 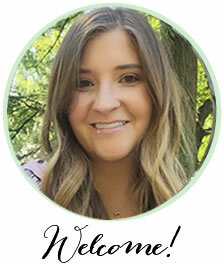 I went cheese-less to keep this a Paleo/Whole30 recipe. Now, let’s talk buffalo ranch. I’m completely obsessed with this buffalo ranch dressing. Like, super obsessed. I’ve been dipping veggies in it, using as a dip for chips, oven fries, and of course drizzling it all over this salad. 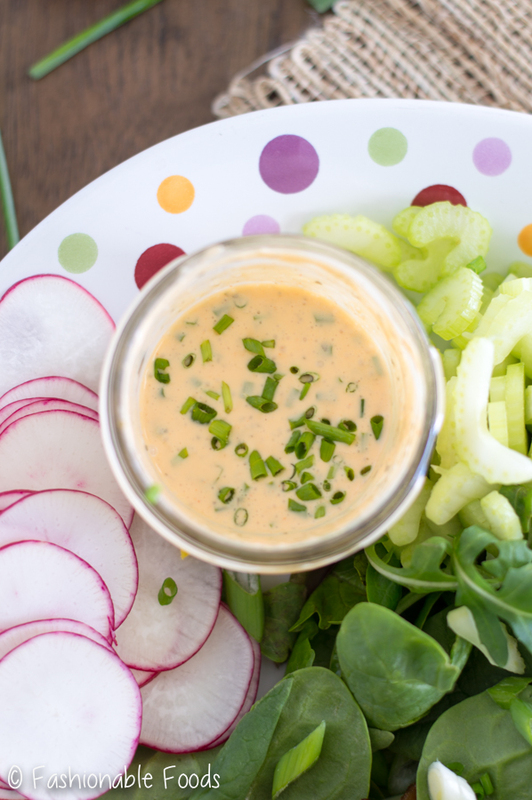 It’s a simple mix of mayo, coconut milk, hot sauce, and spices. Simple, but SO good. And as usual, if you’re not concerned about this being dairy-free, Paleo, or Whole30, you can use milk or buttermilk in place of the coconut milk. 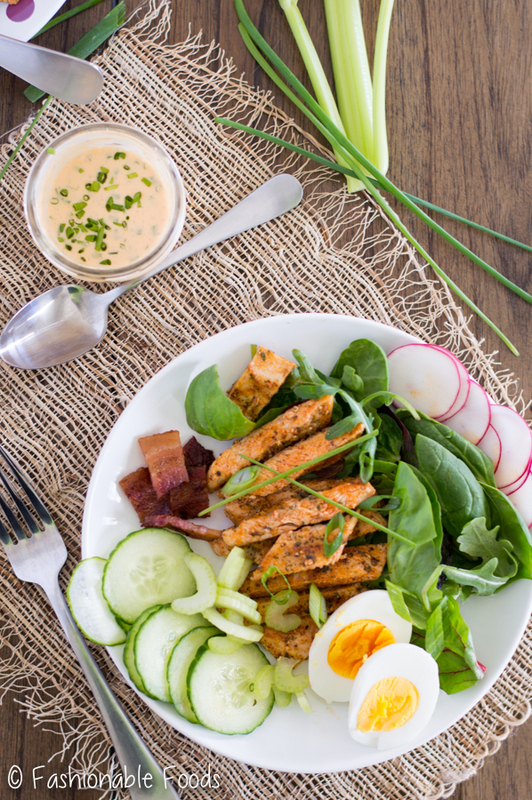 You can keep this salad in the fridge and just build your salads as needed – perfect for quick lunches and dinners. 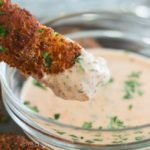 Make the ranch by adding the mayo, coconut milk, hot sauce, garlic powder, onion powder, salt, and pepper into a blender or mini food processor and process until smooth. Pour into a small bowl and stir in the chives. Heat a grill pan, sauté pan, or outdoor grill. In a small bowl, combine the salt, pepper, parsley, garlic powder, and onion powder. Sprinkle the chicken evenly with the spice mixture on all sides. Add some oil to your pan (or oil the chicken if you’re using an outdoor grill). Cook the chicken for 2-3 minutes per side, depending on the thickness. I like to pound mine thin so that they cook very quickly. 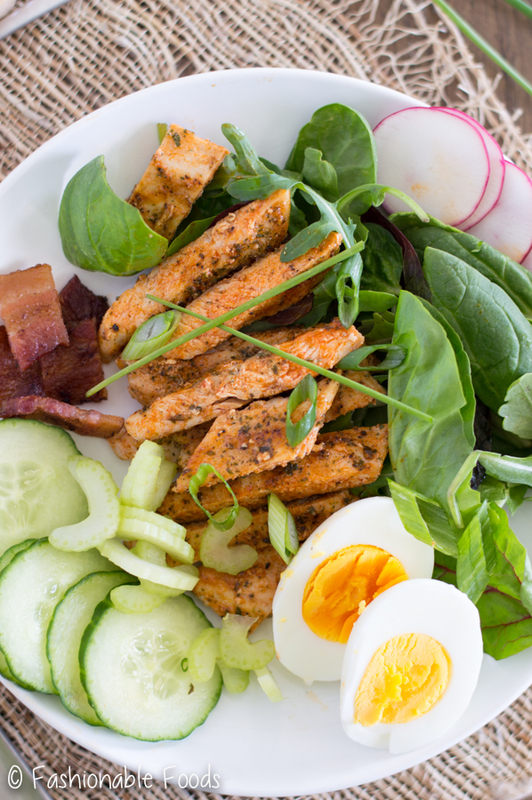 Once all the chicken is done, set it aside on a plate to rest while you assemble the rest of your salad. Lay the lettuce out on a large serving platter and arrange all the ingredients around as desired. Slice the chicken and add that to the salad as well. 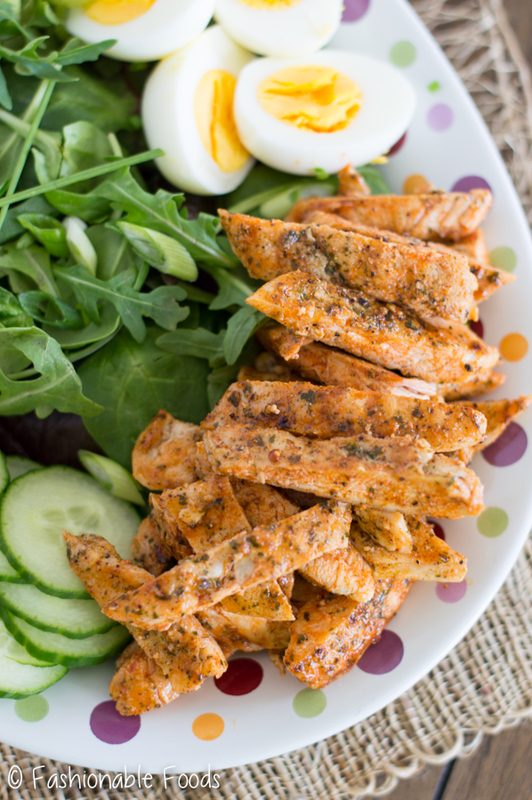 Drizzle each individual serving with dressing and enjoy! *I like to use homemade mayo because it's so easy! Just combine 1 cup Extra-Light Olive Oil + 1 Egg + ½ Juiced Lemon in a jar or tall glass and use an immersion blender to blend until thick - about 30 seconds! 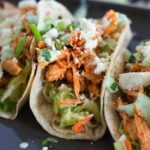 You can also use store-bought mayo here if you aren't concerned about this being Paleo or Whole30. However, there are also some compliant brands out there at Whole Foods or online! We finished phase 1 of our landscaping project in the fall and are about to launch phase 2. I am not excited. I’d rather be eating this yummy salad and watching General Hospital. Seriously, I think I would be perfectly happy with just that dressing!